Nick and Pier Azcona, Gary Caraccioli, and Louis Huntington of Central California put together a group of 20 shooters for a Continental Pheasant Shoot at Rock Springs Ranch in early March. This was the fourth Continental Shoot at Rock Springs Ranch this year, but it was this group's first time shooting high pheasant and they bagged a whopping 73% of the birds. Success on this shoot is usually around 60%. For a Continental Pheasant Shoot, the birds are presented in the same manner as a European Driven Pheasant Shoot. 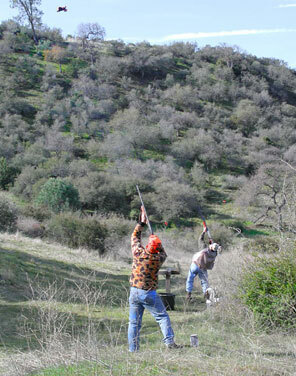 They fly off the top of a tree-covered knoll from 30 to 60 yards above the shooters. The shooters take positions at 12 shooting butts that surround the knoll, and then rotate through the butts as the shoot progresses. The birds must fly through the shooters, but that doesn't make it easy shooting. They are high and deceptively fast and plenty of them escape untouched. Walk-up or rough hunts for pheasant in the traditional American way are far easier... but nearly everyone who tries driven-style shooting can hardly wait to do it again. For more information visit www.rockspringsranch.com.